If you have an AR type rifle or pistol and have been in a gun store in the past six months, chances are you have noticed the new Sig ‘Pistol Brace.’ This oddly looking foam “U” slid over the rear of the protruding buffer tube was designed to fit over the forearm of the user and help stabilize the pistol. It even comes with velcro straps to go around the forearm and secure the buffer tube to the users forearm. Now merely using a ‘pistol brace’ as a shoulder stock is the designing of a firearm? Yes. What can of worms has the ATF opened here!?! On many occasions the ATF has ruled that a pistol cannot have a forward grip because “the addition of a forward grip to a handgun would result in the making of a NFA-category firearm.”(See a second private letter here.) This is based off of the definition that a pistol is designed to be fired from a single hand, and if designed to be fired from two hands becomes an Any Other Weapon (AOW) subject to the NFA. Extrapolating from the ‘pistol brace’ as ‘shoulder stock’ redesign by use, a user of a pistol cannot grip the pistol with a second hand lest he ‘redesign’ it as an AOW. Nonsensical, but consistent. So is it illegal now to use your weak hand to stabilize a Glock? I am willing to bet that nearly every police pistol instructor in the country uses, and teaches, a two handed grip on a pistol. With a simple trip to the local law enforcement range, an ATF agent could make dozens of arrests for failure to register an NFA firearm! He would probably find full automatics and other dangerous weapons to boot. So how is a two-handed grip on a pistol and shouldering a pistol different? By definition the pistol was not designed for either, and if it were, it would not be a pistol. The ATF has not answered this question, and I do not see a consistent logical answer other than to say there is not a difference. Congress considered including handguns in the NFA, and some people lobbied hard to have this happen. However, Congress, after deliberation, chose not to include handguns. Since then the US Supreme Court has determined that the Second Amendment protects the fundamental right to have a handgun in one’s home for self protection. The ATF cannot now reinterpret an eighty year old law to include handguns if redesigned by gripping with two hands without running afoul of the Constitution and the Supreme Court and being arbitrary and capricious in the process. The position that misusing a pistol by shouldering it constitutes making a rifle is little different. The ATF may have made a mistake determining the ‘pistol brace’ was not a stock, and they are now attempting to work around their legal position. 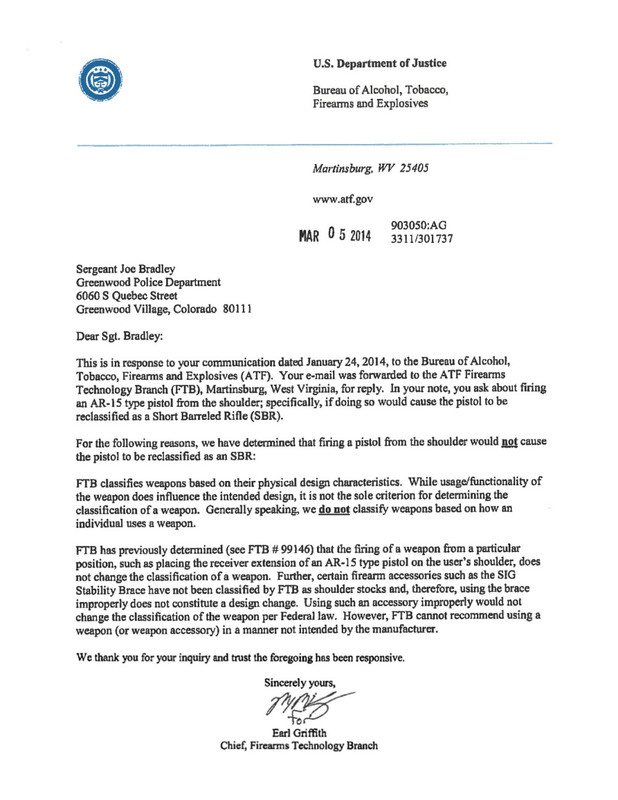 The ATF clearly wants to avoid reclassifying these firearms as SBRs, and thereby duplicating the problems created in the 1990s when thousands of shotguns were reclassified to Destructive Devices. To do so would create a need for amnesty registration, and that is something the ATF only has questionable authority to authorize and would force them to address in some capacity whether machine guns could be registered. The ATF is holding some very inconsistent opinions right now. The problem is, every time they step out of one mess they step into a bigger one. Ultimately it will be firearm owners that suffer the fallout from these poorly thought out, knee jerk decisions.